The Lord Jesus here argues that if it is not blasphemy for the law to call the wicked judges of Israel “God,” in an agentive sense, then it cannot at all be blasphemy for Christ to claim to be the Son of God. Note that the Lord’s argument is itself a form of the lesser-to-greater movement. Whereas the “Gods” of Ps 82 were unjust and under the wrath of God, Jesus is without sin and in perfect union with God the Father. Whereas the “Gods” of Ps 82 held their titles “God” and “Sons of God” merely by the fact that they represented the Lord God, Christ Jesus shares in the exact nature of God and, therefore, is properly called the Son of God. Unlike the Jews, who repeatedly show that they do not share the attributes of, and therefore are not the sons of, Abraham, Jesus’ works repeatedly show that he and the Father share the same ontological attributes. Contrary to the claims of anti-trinitarians, Jesus’ does not reject the claim that he is making himself equal to God. Rather, he rejects the poor reasoning of his enemies, bringing their hypocrisy into relief. The teachers of Israel claim to love the Law, but they seemingly are unaware that even the wicked who perform an agentive function/representative function for God are called “Gods.” How could Christ’s claim to be the Son of God be blasphemy? It cannot. But, as has been noted, Christ goes a step further and identifies himself as the One to whom the terms God and Son of God apply in a distinctly superior and literal manner, as he is the just judge of men sent from God. He is not “God” in the agentive sense, but as regards his ontology (he is “sent” from God the Father) and his attributes (he does “the works” that the Father does). If Christ is the Greater Judge of Israel, and the lesser judges of Israel are called gods and the sons of God, then Christ is God and the Son of God in a distinctly superior and literal manner. By virtue of the progression from the lesser to the greater, therefore, Christ is God Almighty, the co-equal and co-eternal Son of God. 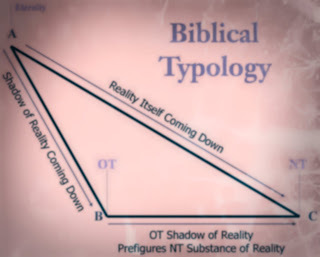 What is also of apologetical value in typology is its testimony to the unitary authorship of the Scriptures. We maintain that the Scriptures are the product of historically ensconced individuals, of course, but they wrote as they were led by the Spirit of God who unites even the most seemingly disparate texts of Scripture by means of an implicit and/or explicit focus on the person and work of the Lord Jesus Christ. That the message of the Scriptures is the Lord Jesus’ person and work, i.e. the Gospel of Jesus Christ, is a truth derived from the Scriptures. It is not imposed upon the text by men with overactive imaginations, but men who have eyes to see that Christ is the center is of God’s self-disclosure. This movement forms a large of the teaching of the book of Hebrews, as has been noted by D.A. Carson in his lectures on the book of Hebrews, available here as a free PDF. See John 5:39 & Luke 24:25-27.